Doug Yurchey was born in Pittsburgh, PA in 1951. While operating an art gallery he ‘encountered’ Katrina Satler, a super-psychic who inspired him to dedicate his life to solving great mysteries. His research led him to the scientific genius Nikola Tesla. 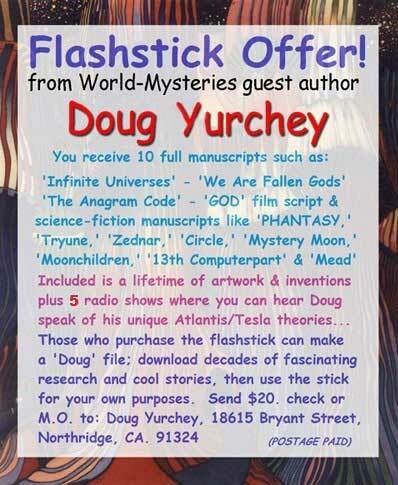 Because of Doug’s study and understanding of Tesla, Yurchey has literally rewritten history. The idea that our ancestors were technologically superior is a vital theme that he has promoted for decades. In 1990, Doug was hired as a background artist on the ‘Simpsons’ TV Show. Yurchey has been on national radio; Italian television and become a successful Internet writer with over 10,000 Google listings. Did a Great Flood happen, WHY did it occur and what about the biblical account of the disaster? When did humans first construct pyramids and megalithic stonework? Did prehistoric people make contact with cultures an ocean away? What is the oldest archeological site on the planet? Was there an ancient World Grid of power? What was the nature of the energy and how does it relate to our long, lost history? How can we improve the quality of life an increase human development? Atlantis most certainly existed. If you want proof, you merely have to look around at people or our society today. WE are Atlantis; we are the new Atlanteans; we are the aftermath of ancient events on Earth. Atlantis was EDEN. We still retain memories of ‘perfect’ times or a Utopian age and a Heaven on Earth deeply buried inside our blurry subconscious. In truth, we HUMANS are a prehistoric space colony that landed on this planet; built a paradise here (60,000 years ago) and it has been downhill ever since. There are endless bits of evidence pointing to a real continent that ‘sank’ in the middle of the Atlantic Ocean, such as above-sea-level terrain on the ocean floor. Fresh water plants and ‘beach sand’ have been discovered indicating areas that were once not submerged. Yet, typical (televised) documentaries paint Atlantis as only myth. Usually, we are programmed to think the fabled land of legend was centered in the Mediterranean. Documentaries emphasize the point that Atlantis myths were the result of wild ‘stories’ on the part of Plato. ‘What happened?’ is an astronomically huge question. It has to do with vast amounts of TIME and how everything in the real, physical world changes over time. If this writer were to claim that ‘WE were the ancient, flying gods of prehistory,’ few people would understand. The facts remain as solid as the cut, trimmed and transported STONE monoliths of the Old World: Our human ancestors possessed greater technology than we utilize today. Long ago, we had far greater mental skills than are employed presently. In every way, we have degenerated from a superior human race in prehistoric times. The ‘proof’ stands not only in stone, but in very large brain cavities of the Cro-Magnons…which absolutely should not exist if traditional views of Evolution were accurate. Darwin Evolutionists are not a little wrong. THEY ARE WRONG IN THE EXTREME! Oh, there certainly was human change over time. But, all the physical evidence indicates a history of devolution; the exact opposite of Darwin ‘progressionism.’ Knowledge; mathematics; sciences did not slowly and smoothly evolve up from the Greeks to modern forms of today. Egypt was much earlier and far more advanced than the Greeks. In truth, every aspect of technology and sciences beyond our scope were mastered by our ancient ancestors. What happened was…so much of numerous Golden Ages have been utterly decimated to ruin in the past. So much was destroyed in unimaginable, high-tech wars that (over time) knowledge and learning and advancement had to begin over again…and then over again, etc. We have technologically, mentally, spiritually FALLEN time and time again in cycles. This ‘lost’ history is ‘written in the rocks’ or supported by Old World constructions that are virtually ‘impossible’ and located in impossible places. Pyramid-building Cro-Magnons were technological and mental ‘gods’ compared to modern men and women. Who really were the cavemen? Who really were the gods in their flying ‘chariots’ or vimanas? To find what actually happened, you must switch everything around from what you have been taught. History is backwards. The greatest constructions were the first constructions. Prehistoric, Cro-Magnon skulls have been found in the high Andes Mountains and elsewhere that are larger in volume than skulls of modern people. This fact as well as impossible constructions of the ancients have been ignored by traditional anthropologists for the simple reason…our educators are very, very wrong. Traditional archeologists and historians must remain blind to real, physical mysteries that show fantastic technical skills of the ancients far beyond the capabilities of our modern age. If the educators acknowledged the true MYSTERY of the Old World, then nothing they have conventionally taught us would make any sense. If they were true scientists, they would not ignore physical facts that indicate traditional explanations have been very wrong. They would see the forest for the trees. Universities with their Darwinian anthropologists will never take the anomalies that Erich Von Daniken has provided, for example, and admit ‘the evidence shows we are in error.’ Instead, educators see the wonders of (impossible) cut and trimmed stonework of our ancestors as mere ‘temples,’ ‘tombs’ or crude astronomical ‘observatories’ built by slaves. In these answers, this writer will separate from Von Daniken’s view that ALIENS were responsible. A very clear distinction will be traced because the alien assumption is another philosophy that needs to be tweaked or refined in order to discover the truth. Sometime around 12-13,000 years ago, the final collapse of Atlantis happened according to Edgar Cayce and other sources. Ignatius Donnelly’s ‘Atlantis: The Antediluvian World,’ written in the 19th Century, was the first book to compare the many similarities between early Egyptians and ancient Indians of Central/South America. Building pyramids; stone statues; stele; architecture; math; physics; astronomy; myths; burial practices and belief systems were the same. Yet, an ocean separated the two cultures that should not have (traditionally) known of the other. The only conclusion was ‘a Mother-Civilization had to exist to account for numerous similarities.’ Egyptians and Incas were the survivors of Atlantis (Eden) and basically constructed New Atlantis on each side of the ATLANTIC Ocean. 2. Did a Great Flood happen; WHY did it occur and what about the biblical account of the disaster? We know there truly was a World Deluge, not just a local flood, because of sea shells discovered high on Mount Everest. Water damage on the Sphinx could also support the idea of a Great Flood. Now, WHY and what of Biblical stories like Noah’s Ark? Consider 8000-year old books of India such as the Mahabharata, Bhagavad Gita and the Vedas. Not only are flying disks called ‘vimanas’ perfectly described, but also terrible nuclear devastation. In this writer’s theory of a Utopian Atlantis and later the Egyptians/Incas corrupting over long stretches of time, WAR was the end result. Nukes devastated lush lands and unnatural formations called ‘deserts’ remained in torrid areas where plants did not grow back. Consider that Cro-Magnons (technical geniuses with large brains) cloned workers and armies because they COULD do such things. But, the workers and soldiers did not need to be brilliant ‘brainiacs’ for their specific jobs. Basically, the clones were ‘human automatons’ with smaller brain cavities. (Brave New World). Human skulls of H*** erectus, Neanderthal and Australopithecus have been greatly misinterpreted by anthropologists. These sub-human forms were not ‘primates’…they were CLONES. We know this because each form of prehistoric human has been discovered together with the other types and on the same geological level. If Darwin Evolution were correct, each group would neatly fit the rock strata demonstrating their type ruled the Earth for a long time until taken over by a more advanced primate. Physical evidence does NOT support progressive Evolution…it destroys traditional, Darwinian views! (‘Made in God’s image’ is a reference to cloning). Now, how could any reasonable person believe in the literal version of Noah in the Bible? You cannot. Generally, here is how the events of 5000 years ago really happened: Many thousands of animal and plant species of the planet were saved along with groups of humans! But, the animals were not alive; they were in STASIS or suspended animation aboard enormous arks. Contained within small genetic-chips, one could preserve the specific ‘codes’ for millions if not billions of different creatures. Later when waters receded, geneticists could revive or physically reform the animals and plant species from the information on DNA-chips. The Chinese have their legends of a Great Flood and arks that sailed. The Maya had records of a Deluge as well as carvings of the great disaster. Numerous myths from many lands point to a type of ‘Waterworld’ that once occurred 5000 years ago and a number of huge ocean vessels that survived the Flood. The impact was that life had to begin again. What should be researched is evidence that every bit of modern technology and real science beyond our wildest dreams existed in the distant past. Study Edgar Cayce’s small book on ‘Atlantis’ for answers. Only futuristic technology can explain the real mysteries of the past. For example, the ‘roofless fortresses’ on top of the Andes Mountains described as ‘impossible’ in these answers…what were they really? If they were strongholds during war, couldn’t their enemies float bombs on balloons into the mountain forts? Truth is…Sacsayhuaman, Ollantaytambo and more recently, Machu Picchu…once had FORCE-FIELD roofs. This speculative and unique conclusion can be realized if one considers many (roofless) mountain chambers of monoliths contain no doors or accessible windows. How do you get in the stone rooms? Today, we need large ladders or helicopters. Back then, the Incas used retractable force-fields roofs like an electric eye. Flying vehicles or people with jetpacks could go in and out force-field roofs while the entire fortress remained safe from atomic attack. The roofless fortresses were mountain bomb shelters. Long after nuclear wars and a Great Flood, the only remains are the building-blocks of the gods that defy our imaginations. This researcher was recently asked, ‘where did the flying vehicles (disks, vimanas, sky-chariots, saucers) and prehistoric MACHINERY go? Why is there no evidence of metal machinery if our early ancestors were so knowledgeable?’ The question assumes METAL is an advanced material, which it is not. It is primitive. Any intelligent society or ‘green-thinking’ society knows to utilize resources that eventually decompose and fall back to the ground as mulch. THAT’S WHAT HAPPENED TO ANCIENT MACHINERY AND ADVANCED VEHICLES…THEY DISSOLVED. Evidence of this fantastic claim can be found by Googling ‘Ford’s Hemp Car.’ Readers will come to a short ‘You Tube’ clip taken from 1941. You will see a ‘plastic’ car ‘grown from the soil’ with side panels STRONGER THAN STEEL. At the end of the clip, people are banging at the back of the car with sledgehammers. The Bakelite-like, very hard plastic, body of the car resists all dents. What the clip fails to mention is the car will EVENTUALLY, in time, decompose. ‘Why make machines and ships out of a substance that decomposes?’ you might ask. Well, an intelligent/utopian society can keep spitting out this natural wonder- material endlessly without thought of COLLAPSE and a technical Fall of Humankind. Unfortunately, many times in the past, history went backwards; society was decimated by war to a less advanced state. When that happened and the ‘wonder-material’ was no longer produced, super devices could have disintegrated into the soil with time. Our ancestors knew to make power-stations out of STONE pyramids, obelisks, monoliths, stele, statues, etc…and even quartz crystal. 3. When did humans first construct pyramids and megalithic stonework? Did prehistoric people make contact with cultures an ocean away? What is the oldest archeological site on the planet? What became known as enigmatic TIAHUANACO high on the Bolivian Altiplano was first constructed 60,000 years ago! Writer/producer Alan Landsburg of ‘In Search Of…’ fame has called Tiahuanaco ‘Earth Base One.’ Landsburg is more right than he will ever realize. Nothing can date stone; we do not know when a monolith was cleaved and transported. We know of no DATE, for certain, WHEN ancient (stone) cities and pyramids were constructed. What this investigator has found is…the older the construction, the more massive the weight of the monoliths or the structure’s ‘building-blocks.’ Also, super-refined construction skills are demonstrated in extremely ancient buildings while later structures were not as well made. Such physical evidence indicates devolution over time and not human progression. Consider that if space explorers wanted to land on Earth and establish a remote, out-of-the-way BASE of operations and not be disturbed…the high plain of the Andes Mountains would be an excellent choice. Today, plants barely grow in the area. The climate is very strenuous on those not used to the altitude and sickness results. How could Tiahuanaco’s building-blocks of incredible precision weigh in the HUNDREDS OF TONS? Puma Punku has been discovered close by that also displays the same extraordinary construction skills. No type of population could survive on top of the Andes Mountains, let alone be able to build such impossible structures. Many of the building-blocks weigh over 100 tons each and some over 200 tons! When one understands that the quarries for the stone masses exist in the lowlands, then we get a small hint of the ‘impossibility’ of these amazing buildings. Giant monoliths were somehow lifted more than a mile straight up mountainsides; cleaved; polished to a fine degree and fit together with incredible exactness. These roofless forts of tremendous building-blocks were truly the works of the gods. The ‘Tiah’ and ‘Teo’ of Teotihuacan stand for GODS as ‘theos’ does for the Greeks. The virtually alien buildings on the Altiplano and elsewhere have come to be known as ‘Cities of the Gods’ or ‘Home of the Gods.’ Where this writer separates from others in the field of early mystery is…WE were the gods. It was extremely advanced HUMAN beings that flew the ‘chariots’ and flying saucer vimanas. At Tiahuanaco stands the Gate of the Sun arch and pillar-like, stone statues in perfect alignments. Construction skills to manufacture these masses are beyond anything else on Earth; more advanced than skills required in building the Great Pyramid. A particular wall contains various stone faces in different configurations. Were the awesome builders of what became known as Tiahuanaco planning the human race? Were the Immortals making the mortals and the stone (model) faces merely templates of what the gods would leave behind? Question 3 asks if people were in contact between continents during prehistoric times, which implies primitiveness on the part of our ancestors. This was not the case. The ancients did not just FLY. The first Indians could teleport at light speed! It is not science fiction to beam/warp at light speed; it is a simple achievement for truly advanced civilizations. If Indians WALKED to the Americas over a ‘land-bridge’ from Asia, then Incan fortresses would adorn Canada and the U.S. Instead, the first Indians constructed an ‘impossible’ BASE in an impossible place. Cut rocks from prehistory ‘speak’ to us. They tell us that WE once utilized anti-gravity and saucer travel. Did Tiahuanaco’s Gate of the Sun function like a ‘Stargate’ means of teleportation? The next answers connect major mysteries around the planet that should not exist. There should not be multiple Cradles of Civilization, let alone more than a dozen. Also, those mysterious locations of FIRST cultures should not fall into a WORLD PATTERN. But, they do. There should not be parallels between other grid-points, but there are. Whereas most researchers focus on a particular ancient site, it is extremely important to STAND BACK and plot exactly where certain prehistoric anomalies are located. Readers will be stunned to learn that the points of ancient mystery form a NETWORK or GRID around the Earth! ‘WHY was the global grid built and why were pyramids constructed?’ was asked. In this writer’s humble opinion: Tiahuanaco WAS Earth Base One whose purpose was to survey the planet; choose the proper locations of the POWER GRID to come. For the colony to survive, it needed power. (Before we build houses, we first install lines of electrical power). We can discover the nature of this power through the unbelievable work of Nikola Tesla. It was a WIRELESS form of electrical energy, good and bad, light and dark, that powered paradise…or, can be corrupted to destroy paradise. 4. Was there an ancient World Grid of power? What was the nature of the energy and how does it relate to our long, lost history? Examine and compare the locations of the Great Pyramid; Stonehenge; Easter Island; New Delhi Iron Pillar; Zimbabwe; Tassili; Inca ruins; Russian ruins; Aussie-land near Alice Springs; Yonaguni; Amazon ruins; Canadian Indian Face. Consider these 12 ‘sub-stations’ and the unusual placement-pattern between them. When you factor in a huge continent in the Atlantic Ocean that no longer exists; an almost perfect GRID forms of a main power station with its surrounding 12 sub-stations. Does 13 Original Colonies or 13 Cradles of Civilization strike bells in our collective consciousness? Is the fall of the human race the destruction of Atlantis and the source of unlucky 13? Notice the African continent with its three grid-points. A perfect triangle takes shape when you connect Giza, Tassili and Zimbabwe. ‘Zimbabwe’ means ‘House of Stones.’ We are not taught that early Africans cut and transported massive weights like the Egyptians and Incas. Smaller Zimbabwe ruins stand (in grid-patterns) around the main complex. The pattern repeats in pyramid civilizations where smaller pyramids along with standing stones or stele (sub-stations) surround the main stonework (primary power station). Even Mound-Builders built in this pattern over long distances; only this was a much later time when stone was no longer the building medium (earthen material). Energy can be transferred through the ground and what seems as a stone ‘ceremonial center’ becomes an electrical, power station. The energy was stepped-down to smaller, local sub-stations in the same way our WIRED power is today. We need different eyes to properly understand the fantastic ruins of the Old World. Returning to what may be Atlantean grid-points, measure the distance between the three locations in Africa. You will discover that this distance is the same as the distance between the Great Pyramid and Stonehenge. It is the same distance between the Great Pyramid and the New Delhi Iron Pillar. The rustless, misnamed ‘Ashoka,’ METAL pillar is one of the most phenomenal mysteries of the past. The magnetic iron is a product of an extremely advanced culture that created such a pure, metallic substance. Nowhere else can be found this degree of metallic purity. The metal is actually black magnetite, yet the over twenty-foot high POLE is as ‘alien’ an anomaly as there could possibly be. No one knows its true age as it stands in back of an East Indian courtyard. If we drew a line through the planet, we would find that the New Delhi Pillar and Easter Island are on the exact opposite sides of the Earth. The two locations were once magnetic poles to one another as many of the grid-point colonies were to the other. India was one more first culture with early records (as mentioned) that actually survived thousands of years. This was the land of flying disks known as ‘vimanas’ in the books, but commonly called ‘flying carpets.’ The New Delhi pillar could easily have functioned as a TESLA COIL in essence; wirelessly fueling (induction) flying disks as well as everything else within range. The Pillar even has a ‘capital’ or odd crown (ball) at its apex and appears as a metallic ANTENNA. Was the purity and magnetic quality of the magnetite a result of broadcasting electricity for thousands of years? National Geographic filmmaker Diego D’Innocenzo interviewed this writer because of the theory. The televised documentary was aired in Italy and viewed by nine million Italians. Another impossible Cradle of Civilization that goes back before memory is the lone outpost known as Easter Island. No group of ‘first’ humans should exist on any small island situated 2300 miles from the mainland! No group of ISOLATED first humans should have been able to construct in the same way as the ‘gods’ from other lands. Consider that originally there might have been only one enormous, stone statue receiving and distributing the electrical energy. But, when the power blew or Atlantis continent sank and destroyed the energy network, the islanders were stranded. They could move local weights, but they were completely cut off from outside help. Easter Islanders created ‘receiving dish’ after ‘receiving dish’ (giant statues) but gave up when they found the problem was at the SOURCE. Power that had always been there was now GONE! Other researchers have noted numerous similarities between the grid-points or sub-stations outlined here. It was as if the ‘same construction company’ went out and built different facilities with the same knowledge; math; physics; and advanced techniques. Study prehistoric evidence such as odd rock-paintings in the Alice Springs area of Australia. Sixty-thousand years ago, evidence points to a lush continent down under. There was no Outback. There are old legends of a ‘dreamtime’ with great creatures that roamed the land. Something changed the forests and lush terrain to the centrally located, vast desert of today. In the same way, Tassili (with its incredible cave-paintings) indicates a fertile landscape before something changed the environment to the desolate Sahara Desert. Nuclear devastation fits the bill and accounts for many widespread cultures building seemingly bomb shelters. Green glass has been discovered in a few deserts, which we know for a fact is a byproduct of atomic explosions. Australia’s Ayers Rock should not be overlooked in our examination of Aussie mysteries. In the middle of a huge plain stands a red rock that is the largest single stone on Earth. It is completely out of place; positioned vertically where we only see the very top. It is one, extremely long, MAGNETIC pole near Alice Springs…which connects it with unusual petroglyphs, etc. in the area. Native aborigines know the red rock as ‘Uluru.’ The special stone holds a sacred place in their ancient society. Was the magnetic pillar used to magnify or broadcast EM power in early times? Underwater Yonaguni, off southern Japan, is one more anomaly that defies belief. The strange ziggurat on the ocean floor suggests another age when people built in a way far beyond anything accomplished presently. Atlantis was responsible for the existence of the Indian Races (Egyptians/Incas) or all non-Asian civilizations. But, Asians are not Indians and have an origin even before the existence of Atlantis. Asians have their own stories of mythical Lemuria or Mu in the Pacific Ocean. The Hawaiian Islands are supposed to be small remains from a much larger land mass that also was destroyed in the mists of time. Researchers should find it interesting that Asians are centered in the Pacific while Indian cultures appear to be Atlantic-centered. Possibly, the Atlantis (space) colony took control of the planet after the demise of the Asian civilizations. Finally, to round out a virtually perfect GRID-PATTERN worldwide, we have a fairly recent discovery by ‘Google Earth.’ A face (profile) of an Indian right off the old penny was found when we view the ‘badlands’ region of Canada from high above. Could this area connect to other grid-points and to ancient Atlantis? Another curiosity is the fact that the image is of a huge INDIAN while prehistoric remnants of Indians are not found in Canada (where they should be). Could the image have been created to simply mark the one original grid-point, sub-station that was never rebuilt? Most of the prehistoric grid-points were rebuilt over the millenniums by various empires of inheritors. Humanity, in its course of downward cycles, seemed to continuously reconnect the World Network of Energy; only to end in disaster and no power. Were next generations attempting to recharge old monoliths to have them function again as utility poles? Were they trying to reattach ancient ley lines? We have broken through exteriors of pyramids only to find another exterior and then another. It was as if the same ground remained sacred to next generations. This fact may have had a scientific reason rather than religious. To conclude, we can trace the Fall of Humanity from Atlantis to its survivors…the Egyptians and Incas. In the western world, we can ‘read the rocks’ and understand that our ancestors built a stupendous system of mountain strongholds for thousands of years with no hieroglyphs (or need for writing or speaking). Then, flying Toltecs appeared in the jungles of Central America and began next generations with incredible math/hieroglyphs. Toltecs begat Olmecs; Olmecs begat Mayas; we know this because of the advanced bar-and-dot number system and hieroglyphs that the later Mayas inherited from earlier (scientifically sophisticated) Indian ancestors. It is no mystery where these amazing cultures originated from; they emerged as the next empire to control the planet. Indians came down from the fortresses in the sky because it was now SAFE. They did not have to hide and could flourish in the lush, fertile jungles of the lowlands. Aztecs were what was left from Mayan empires and then humanity kept falling over time to Indians that could not move (anti-gravitate) STONE anymore. Fantastic EARTHEN structures of the Hopi, Anasazi Indians and Cahokia Mound-Builders in Ohio demonstrate building skills far and above commonly known Indians of the Old West. This is clear DEVOLUTION. Even a teepee (crude antenna) collected a small residue of natural, electro-magnetic energy that is everywhere around us. In the eastern world, there were many ages of Egyptians; the Super-Egyptian, the Pre-Egyptian, the Egyptian, etc. In the beginning, there was no need for writing or speaking. First Egyptians had no hieroglyphs or need for them. When the first writing became necessary, first hieroglyphs were amazing carvings in stone. Sculptured etches were deep and precise gouges in rock; virtually impossible today. Hieroglyphs have been misinterpreted by archeologists because of the bogus Rosetta Stone. The symbols are actually ‘ideograms’ and impart far more information than we credit. Hieroglyphs are truly ‘over our heads’ and communications by the gods that we really do not understand. To stream the flow of empires in the ancient east, after much time…Egypt begat the Sumerians and then came later Babylonians. Great, advanced civilizations lived and died long before the ‘ancient’ Greeks. One more thought on Egypt and why GIZA at the Nile Delta is such a special place; where the Great Pyramid stands is the exact center of all land masses on Earth. With a presumed continent sunk in the Atlantic Ocean and you wanted to reconstruct a new World Power System, Giza was the perfect geological location to place your primary energy-beacon. 5. How can we improve the quality of life an increase human development? WE HAVE TO STUDY NIKOLA TESLA if we are ever to ‘improve the quality of life’ and increase our speed of development. Today, society is unaware or made-to-be unaware of the grand achievements of Tesla. Tesla was taken out of books and discredited by the western world, for the most part. The reason is…we went the wrong way and developed WIRED ELECTRICITY. You see, Tesla made obsolete his own Alternating Current invention by combining radio and electricity. Tesla created all aspects, every important patent, which had to do with electrical power. Tesla created all aspects, every important patent, which had to do with RADIO. His ultimate invention was a ‘power tower’ transceiver called a ‘Magnifying Transmitter’ also known as ‘Wardenclyffe.’ This futuristic station resembled a giant antenna nearly 200-feet high. It was placed in the New York City area to handle the large population circa 1900-1905. The famous Stanford White designed the non-technical architecture of the electrical transmitter. NY was to be a (power) RADIO CITY. It would have changed the world! Here is the secret as to why Tesla was so utterly banned: His power towers; this form of BROADCASTED ELECTRICITY (through the ground, really) is incompatible with our electronic systems and world media of today. Tesla technology is like enormous MAGNETS. As you well know, magnets are not to be put on computers or anywhere near speakers/electronics. If someone were to recreate Tesla’s wireless energy experiments and TURN ON a modest-sized power antenna within a city, there would be static on that city’s phone lines and on the city’s television and computer monitor screens within range of the disrupting tower. Tesla Coils are verboten anywhere around electronic equipment. (What good are they? Tiny Tesla Coils are used in many devices as a way to magnify energy). Tesla’s type of energy or broadcasted, electrical transmissions cannot be utilized until we have totally abandoned our computers/cell phones/wired power systems and basically all of our present media. Tesla would have disturbed nothing…more than a hundred years ago. Maybe, we are doing things the wrong way today? Possibly our electronic systems, from phones to computers, are harmful in the long run? People living under A.C. power lines report a high degree of illnesses and fatal diseases. Could the ancients have utilized a global power system that was not harmful in any way? Did pyramids tap into and amplify natural, electro-magnetic energy; the same force that moves a compass needle? Possibly, Mr. Tesla discovered (or was told) that humans at the beginning of the 20thCentury were not ready for the seeds of Utopia. This was not the right time. And now, today, without much improvement as we still have our warlike/aggressive tendencies, we remain outcasts of Eden; still not ready for a technical Heaven on Earth. Did aliens or some ‘higher authority’ inform Nikola that these silly humans were not ready; World War I was in the wind. His transmitter can be tuned; the power intensified…and instead of Free Energy everywhere (believe it or not), the entire planet could be shattered!! Arthur’s answer was, ‘it will be so very long in the future…that no one then would have even heard of Nikola Tesla.’ For one, this means it will take ages…possibly a thousand years…before we will (again) employ the power system of the gods. But it also means that Atlantis will, one day in the far future, return. Tesla wrote of 8 OTHER POWER TRANSMITTERS, at specific global locations, to completely cover the planet with usable energy. Wardenclyffe, if successful, could only wirelessly power those machines and vehicles in the New York area. If a modern World Grid of 9 stations was installed, then from the ground to the ionosphere would exist a charged field…to be plugged into by simply using the appropriate antenna-dish on every machine and vehicle. A power-pole in everyone’s backyards could supply more than enough energy to run all the houses. Imagine electrical power at the top of Mount Everest and high above…to the depths of the Marianas Trench! Consider the future, hundreds of years ahead, when we ARE ready for Paradise. Possibly, terrible wars could be in store for tomorrow. After we are finished with our wars; militaries and misplaced patriotism; when there are no more countries…maybe then…the meek shall inherit the Earth and a new cycle can begin. Or, maybe it will just be compassionate scientists who are finally in charge and do things the right way. But, the World of Tomorrow has to be very careful. If all vehicles, cities and houses are powered by Tesla’s ultimate system of wireless energy…the transmitters must be protected. If war breaks out and the transmitters are destroyed…then everything halts; the power-plug is pulled and humanity takes a giant step BACKWARDS (again). This is our long lost, spiraling down, reverse-history due to ultimate wars. People did not begin in caves; we were forced into them to survive the nuclear fall-out. This writer does not believe we were the product of aliens or had alien Creators (examine the 13 Cradles of Civilization once more.) HUMANS began in those particular colonies which form a connecting, worldwide grid-pattern and spread out from there. We are one people. We are linked. Only time, awful wars and politics have separated us from being one colony of Earthlings. We have forgotten our distant past like a bad dream. But every time we take bold steps into the future with new, scientific innovations…we are remembering.